Shechem, a City of Refuge. Photo by Leon Mauldin. Welcome to the birth place of Yahwism! 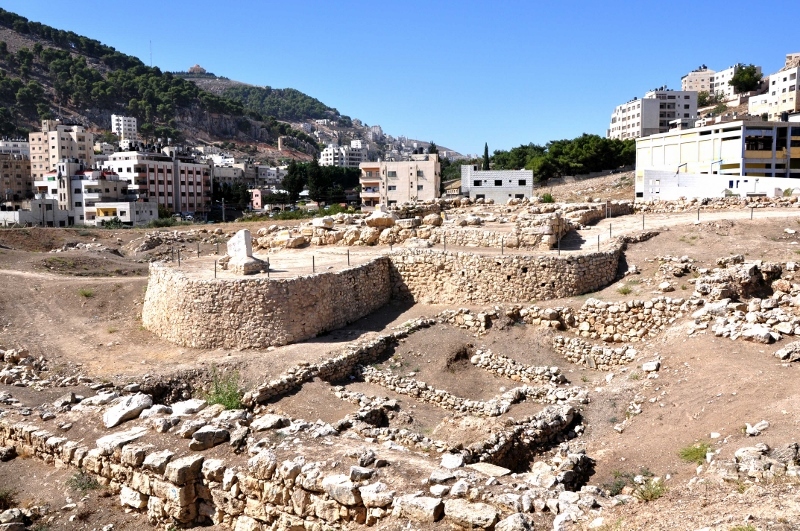 The site of Shechem lies within modern-day Nablus, in the Occupied Territories. The above photograph shows the ruins of Tel Balata and the temple of Baal Berith (literally “Lord of Covenant” in Hebrew). The ruins include two gateways, extensive enclosure walls and revetments, and remains of the temple. This is where Abraham lived nearly 3,500 years ago and where his descendants started venerating the great lord with whom he made his covenant through the cult of the ancestors. Judaism/Christianity/Islam: All three monotheisms refer to Abraham as the father of their faith because of the covenant he made with the Lord, and as such, this is the cornerstone story on which most of the world’s cultures stand. Atheism: Atheists have (and continue to in many countries) put their lives at risk for challenging religious traditions and the existence of an omniscient and jealous God. Now is the time is to come together and acknowledge that monotheistic beliefs have kept a remarkable story alive. The Lotus: Ancient Egyptians associated the lotus to rebirth and the sun because of the way it emerges from the pond. The lotus is seen as a sign of rebirth, purity and spiritual enlightenment in many cultures. Spiritual enlightenment, when stripped of all forms of dogmatic belief, can enhance the capabilities of the human mind. The lotus is the symbol of hope and spiritual freedom that can be achieved when letting go of our dogmatic beliefs. The earth: The earth unites the two distinct ideas comprised in the Earthly Covenant: on the one hand, it reminds us that Abram made an earthly – rather than divine – alliance; and on the other, it personifies Mother Earth, goddess of nature, motherhood, fertility, creation and destruction. It is the common ground that unites us all. The people: Proud, free and welcoming. They are holding hands and represent the ultimate goal of brotherhood, peace and harmony that is achieved when dogmatic beliefs are replaced with pure love.